When a person seeking protection enters the United States, they are often placed in immigration detention—a costly, largely unnecessary move that negatively impacts an individual’s physical and mental health, as well as their ability to secure legal representation. There are, however, two ways an asylum seeker may be released from detention: parole or bond. These processes, which were put in place to make sure that asylum seekers who pose no risk to the community do not arbitrarily languish in prison, have been implemented in wildly inconsistent and sometimes illegal ways. 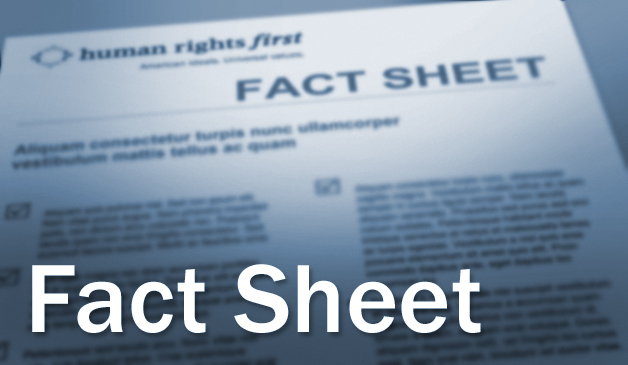 Human Rights First has fought the Trump Administration to ensure that those who are eligible for release do not suffer behind bars. What are the ways an asylum seeker can be released from detention? An individual in the expedited removal process who expresses a fear of return to their country of origin is entitled to an interview with an asylum officer. If they demonstrate a “credible fear of persecution or torture” in their country of origin, they are entitled to a hearing before an immigration judge to adjudicate the asylum claim. Asylum seekers held in custody typically spend months in detention while their cases are pending and will often be held more than a year if there are appeals to the Board of Immigration Appeals or a federal court of appeals. Asylum seekers can be released from immigration detention on parole, if they arrived at an official border point, or bond, if they came into the United States between official entry points. If the asylum seeker requested refugee protection at an official border crossing point or an airport, they are deemed an “arriving asylum seeker” and can be released from detention on parole by Immigration and Customs Enforcement (ICE). According to the 2009 Department of Homeland Security (DHS) Parole Directive, asylum seekers who have established a credible fear of persecution should be granted parole in the “public interest” and released from detention during the pendency of their asylum claims if the individual establishes their identity and demonstrates they are not a flight or security risk. Parole requests are determined by ICE—the same agency that also detains asylum seekers and immigrants—thereby leaving ICE as both judge and jailer. Under the Parole Directive and the Fifth Amendment of the Constitution, ICE is required to conduct individualized case-by-case determinations in each case. ICE also has discretion to set additional conditions when granting parole, if needed, to ensure an individual asylum seeker’s appearance in court. ICE can, for example, demand that an asylum seeker participates in an appearance support program or wears an electronic ankle monitoring device. In some cases, ICE has actually required asylum seekers to pay monetary bond, a controversial measure that blurs the line between parole and bond. As indicated by the high court appearance rates for asylum seekers, however, these additional conditions are generally unnecessary as asylum seekers have strong incentives to appear in court to pursue their claims and achieve legal status in the United States. If the asylum seeker crossed into the United States between official border points, they may be released on bond. Bond may be granted by either ICE or an immigration judge in a custody hearing. In setting a bond, ICE or the immigration judge conduct a “risk classification assessment,” which typically examines: how likely the individual is to appear for their court hearings; their community or family ties; prior appearances at hearings; manner of entry and length of time in the United States; and whether they are a danger to the community. If an asylum seeker cannot afford the bond set by the ICE officer, they may request reconsideration by an immigration judge in a custody hearing, known as a bond hearing. The law provides immigration judges with the authority to either impose a monetary amount, the minimum being $1,500, as a condition for release, or if circumstances warrant it, to impose non-monetary conditions, such as an electronic monitoring device, to their release order. Immigration judges are not actually required to set a monetary bond and may choose to release an asylum seeker on conditional parole. In practice, however, this rarely occurs. How are parole and bond actually implemented? The government’s own data shows that in at least five ICE field office districts nationwide, ICE has ignored its own parole guidance and denied parole to an average of 96 percent of arriving asylum seekers since early 2017. If parole is denied by ICE, the decision cannot be appealed to a judge—not even to an immigration judge overseeing their immigration case. While an immigration judge can, and in certain parts of the country, must, consider financial ability to post bond, attorneys and advocates across the country have observed how imposition of unduly high bonds keeps asylum seekers in unnecessary and arbitrary long-term and prolonged detention. The median bond amount set during the first eight months of fiscal year 2018 was $7,500, an increase of 50 percent from the median bond amount of $5,000 five years ago. Even the statutory minimum bond amount of $1,500 may be too high for asylum seekers to pay and can lead to prolonged detention. Despite having the legal authority to forgo setting a monetary bond, almost all immigration judges do—most likely due to a misconception that they must impose a bond. Do released asylum seekers appear for immigration court hearings? Data indicates that in absentia rates—rates of individuals ordered deported because they were not present in the courtroom—for adults released from ICE custody by an immigration judge have declined significantly in recent years. In fiscal year 2015, 86 percent of adults released from detention on bond complied with their court appearance obligations. 77 percent of people released from detention on bond or parole appeared for their immigration court hearings. Families and children with legal counsel overwhelmingly appear in immigration court, with 97 percent of represented mothers whose cases were initiated in fiscal year 2014 complying with immigration court hearing obligations. Similarly, 98 percent of children whose cases were initiated in 2014 and who were represented by legal counsel were in full compliance with their court appearance obligations as of December 2017. Alternative to detention programs also lead to extremely high appearance rates. For example, community-based case management programs piloted by Lutheran Immigrant and Refugee Services and U.S. Conference of Catholic Bishops’ Migration and Refugee Services have shown high compliance rates of 96 to 97 percent. ICE’s Family Case Management Program, which provided case worker support to families, led to 99 percent compliance with court appearances and ICE appointments. The Trump Administration discontinued the program despite these high success rates.